When it comes to choosing a student loan lender, who you work with can really make a difference. Loan factors like interest rates, fees, customer service and other benefits all have to be taken into consideration in order to make the right pick. You’ll also want to make sure that the lender’s values and commitment to students are in line with your visions and goals. This means working with a lender that you can trust and build a relationship with is an important factor to your educational success. As we learned in Student Loans 101, there are several financial aid avenues to explore in addition to taking on a private student loan. Once you’ve explored your other options like grants and scholarships, it’s time to look for a lender that is right for you. 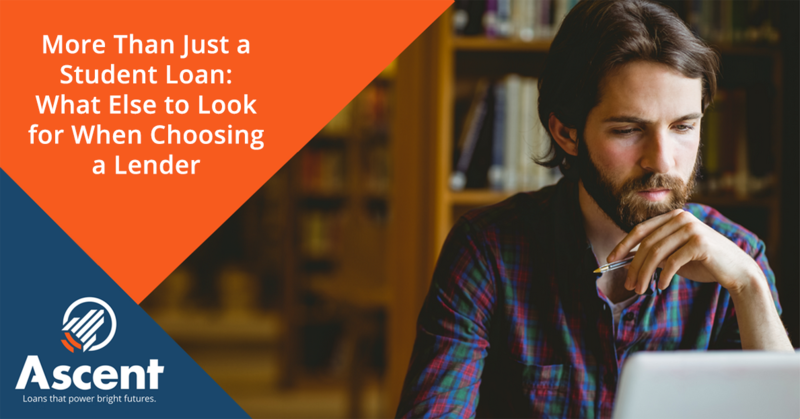 To help you make the right choice, let’s take a deeper look into what you should look for when choosing a student loan lender. A lender serves as a partner to help you reach your college goals, and this can mean being part of a lending relationship together for several years. This means you’ll want to be sure that your lender has your back, understands your goals and provides you the support you need. See that your potential lender has plenty of student-centered resources to help you gain a better understanding of what taking on a loan means. These resources should also help you get an idea of what working with this particular lender will be like. If you have questions, do you feel they are taken seriously and answered in a timely matter? Find a lender who is committed to providing students like you with support and additional resources. There is no cookie-cutter or one-size-fits-all approach to getting the right student loan. Every situation is unique, and you’ll want to make sure you can customize your loan to fit your current arrangements as well as your future plans. Look for a lender who offers customized approaches rather than impersonal plans that aren’t suited to your needs. You’ll also want to consider whether your student loan will be applicable toward some of your education-related living expenses like room and board. You won’t be able to devote time to your studies if your living expenses aren’t taken care of. While your student loans shouldn’t be treated like free money to spend on anything, they should give you the support you need to fulfill your educational requirements. Having a low interest rate on a loan can make the difference of hundreds or even thousands of dollars in terms of your repayment costs. Play around with a loan calculator to get an idea of how different interest rates can affect the amount of money you end up spending. You can compare your potential lender’s rates with the national averages in order to understand how competitive their offer is. Another factor to consider is whether there are application fees involved. These are also sometimes known as origination fees. 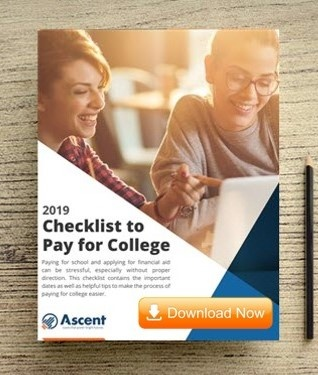 Some loans, such as the Ascent Tuition Cosigned Loan, waive application fees altogether, which can be a big advantage when considering what loan may be right for your needs. In addition to having competitive rates, you’ll want to explore some of the other options and benefits available with your prospective lender. Some of the most important factors in choosing a loan are the available repayment options. You may come across terms such as “interest-only,” “minimum” and “deferred” repayment plans. Be sure to reach out to your potential loan provider in order to understand what these different options are. Checking out some repayment examples can help you get a better idea of what your repayment path may look like. If you opt for a loan that requires a cosigner, you may want to consider a plan that allows you to release your cosigner after a certain amount of time. This can give you increased independence and allow you to build credit as you make on-time payments. Does this lender demonstrate a commitment to student’s needs and goals? Are there adequate customization options to make the plan work for me? Will my student loan be applicable toward eligible living expenses? What are the available interest rates and are they competitive? Are there any application fees or other hidden costs? Are there other benefits, such as the ability to release my cosigner? Loans such as the Ascent Tuition Cosigned Loan address these factors. With these tips in mind, you’ll find that working with the right lender is about more than just a student loan—it’s about partnering up to make your educational future a success. Previous Do You Need a Job as a Full-Time College Student?